With Prometheus director Ridley Scott returns to the universe he created in 1979 with the release of Alien, to tell a distinctly different kind of story. Different from the one he told in Alien that is, not at all different from the one someone else told in Star Trek V: The Final Frontier. The exploratory research ship Prometheus. Star Trek V is the one where the crew of the Enterprise goes looking for God and finds something less friendly instead. The same thing happens in Prometheus and the fact that the movie was able to recycle almost precisely the same plot of that lowest of all Trek movies, but actually make it good, will likely never get the level of praise it deserves. Prometheus has all the same big ideas of Star Trek V wrapped up in the exact same plot but it presents them in a way that doesn’t make a mockery of its audience, and, also may scare the pants off them a time or two along the way. Unfortunately those big ideas aren’t always fit seamlessly into the narrative of a movie that doesn’t quite find the right balance between introspection, character development and spectacle. When in doubt Prometheus leans towards explosions and giant tentacles so, if nothing else, you’re sure to be entertained on a surface level. It will leave you wondering about the rest. Maybe that’s for the best. Some of the characters are well developed, others like Charlize Theron’s corporate lackey Meredith Vickers are so good they leave you wishing there was more. However, the majority of the research vessel Prometheus’s crew is only background noise, given a brief moment of glory before the script is done with them, but no personality beyond an accent and the occasional one-liner. Prometheus asks important questions mostly in the background of a story about two scientists who lead an expedition looking for an Alien species they believe may have created humanity. While occasionally layered into the story almost awkwardly, when its working it’s that belief which makes Prometheus so interesting. One of the two scientists is Elizabeth Shaw (Noomi Rapace) and she was raised by a Catholic father. As a child she asked her dad for proof of his hope in an afterlife and he answered by telling her that he knew it was true simply because he believed. That stuck with her and so Elizabeth has applied this same philosophy to her research. She has no proof that these aliens they set out to find have invited them for a visit, she simply believes it, and in her head that means it must be so. Somehow she’s managed to convince others to go along with her. Elizabeth is wrong, but not in the way anyone expects. 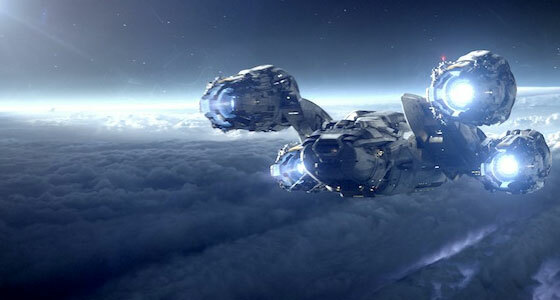 Prometheus takes time to build up its premise with incredible special effects shots and a detailed tour of the futuristic world aboard ship. That’s important because when things go wrong, as eventually they do, they go wrong pretty quickly. While this movie isn’t as scary as Alien it’s a taut thriller in which humans are given the chance to display both the best and worst of what they have to offer. Perhaps even more important than humanity’s quest to find its maker is the slow awakening of its own creation. The crew is shepherded on its journey by a robot, named David, played so brilliantly by Michael Fassbender that if this wasn’t a science fiction movie (the Academy usually ignores them) he’d win this year’s Best Supporting Actor Oscar. David loves old movies and he quotes them endlessly, smiling with innocence as he works towards a secret agenda. His robotic journey alone is worth the price of admission, but the thing you should really pay attention to in Prometheus is the religious meditation going on in the background. You’ll probably walk out wondering about the true nature of the aliens Elizabeth and her crew discover, but I think the question Prometheus really wants to ponder is one of faith. It’s belief, blind belief, that’s at the center of everything that happens in Prometheus and in the end the script seems to be asking not whether God exists, but whether faith in any form is all it’s cracked up to be. 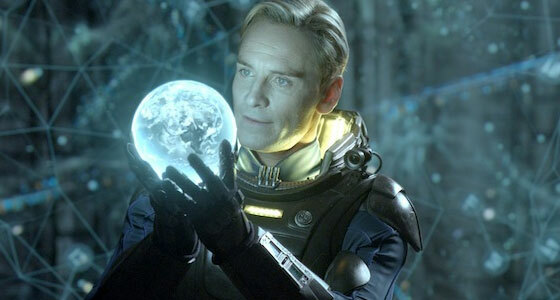 The characters in Prometheus seem determined to keep right on believing, but should we? For Doctor Elizabeth Shaw, right or wrong, there may be no other choice. I’m sorry to break it to you guys, I saw the movie yesterday and it’s 2 stars at most. Without giving spoilers, I’ll just say that they try and fit too much in, and as consequence it’s all over the place, also some almost b-movie sequences. It’s like they picked things out of hat, and somehow tried to glue them all together to make a movie. If you liked Alien Resurrection, this is on about the same level, so it’s a bit of fun, best enjoyed while drunk. Though Michael Fassbender is pretty amazing, saves the movie. This is one of the best reviews i have ever read. I love the way you describe the movie! So.. according to your review, it looks like faith truly is the substance of things hoped for, the evidence of things not seen. Sounds like Hebrews 11:1 to me.